Welcome to our SEN Information Report which forms part of the Leeds Local Offer for students with Special Educational Needs or Disability (SEN) in accordance with the Special Educational Needs and Disability Code of Practice, January 2015. Have a disability which prevents or hinders them from making use of educational facilities generally provided for others of the same age in a mainstream school or post‐16 mainstream institution. This definition of disability includes children and young people with long‐term health conditions such as asthma, diabetes, epilepsy and long term illness. Children and young people with such conditions do not necessarily have SEN, but there is a significant overlap between disability and SEN. A child or young person may therefore be covered by both SEN and disability legislation. Our facilities for helping disabled students to access the school are described fully in the school’s Accessibility Plan, available on our policy page. If a student has long term health care needs or takes prescription medication at school we require an Individual Healthcare Plan completed parents/carers with SENCO guidance as needed. Who can I talk to about SEN? Co-ordinating the support for students with SEN and developing the school’s SEN Policy. Providing guidance and training for teachers and support staff in school, so that they can help all students achieve the best possible progress. Ensuring that the school’s SEN Policy is followed in classrooms and for all students with SEN. The pastoral team provide information, advice and guidance to vulnerable students in school. They work in close partnership with teachers, parents/carers and external agencies. They identify concerns and issues at the earliest stages to remove barriers to learning for students and resolve issues e.g attendance, finance, peer difficulties. They also provide 1:1 emotional/social support sessions to identified SEN students. Ensuring that the Governing Body is kept up to date about any issues in school relating to SEN.
Making sure that the school is providing the necessary support for any student with SEN who attends the school. What SEN training do staff receive? Dyslexia Awareness and differentiation – Guidance on how to differentiate for students with SEN according to their need and keep this under review as part of our “Graduated Approach”. Provision on the school website for a Special Educational Needs Glossary to help all of our staff understand what SEN terms mean and how they can help students. Regular feedback from SEN learning walks and learning enquiries. How do we identify students with SEN? Some of our students with SEN will have had their needs identified in their previous schools. We need to ensure that we support them as effectively as possible when they transfer to UTC. We therefore ensure that we have robust and monitored transitional support procedures in place so that we are aware of students’ needs as early as possible. As part transition, a student support assessment is completed with student and parent/carer. Student needs are assessed and successful strategies for meeting needs are planned. Once agreed with students and parents, this document is shared with teaching and support staff. All students complete Baseline/CATS reading tests as part of the interview process. Students may also be referred to the school allocated Educational Psychologist. At UTC we are committed to ensuring that all students have access to learning opportunities and we will intervene with those who are risk of not learning to age‐expected and age‐appropriate levels. Our SEN profile as of Autumn term 2018 shows that we have 72 students (21 % of the school roll of 345 ) identified as having SEN; 7 of these have an Education, Health and Care Plans (maintained by either Leeds City Council, Wakefield or Kirklees Local Authority). 19% are solely related to Social, Emotional and Mental Health issues. The SEN Code of Practice advocates a ‘graduated response’ (See diagram below) to meeting a student’s needs. Where a student is identified as having additional needs the SENCO should be contacted initially. The SENCO and teachers will review the approaches, ensuring students and parents/carers are fully involved at each and every stage. We value high‐quality teaching for all students and monitor the quality of learning and teaching in the school. We use a range of methods to do this including regular lesson observation, work scrutiny by Heads of Department and Senior Leaders, learning walks, continuous professional development training for all staff. We regularly monitor the progress of all students, and staff continually assess progress to ensure that learning is taking place. High quality teaching, differentiated for individuals, is the first step in responding to students who have or may have SEN. If adequate progress has not been made once these interventions have been put in place, additional support may be provided. This may be through differentiated smaller class sizes and optional groups. SENCO will write a student support plan – this is a non statutory document outlining needs and support for an individual. Advice from external professionals may be needed. Where concerns remain or progress is not being made, despite sustained intervention, the school will consider requesting an Education, Health and Care Plan (EHC Plan). The EHCP sets out the student’s strengths and needs and details the provision for the student in the areas of education, health and social care. 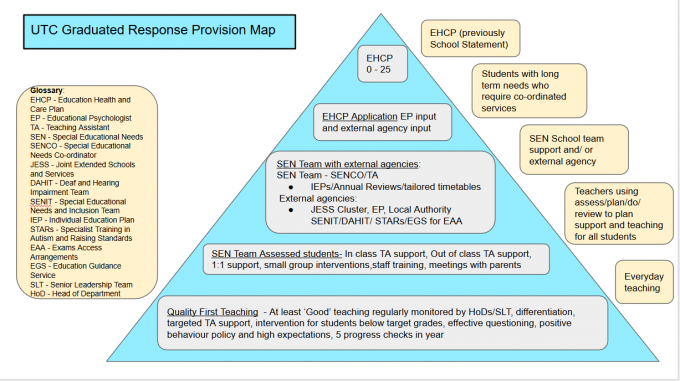 How does UTC support students with SEN? Every teacher is an inclusive teacher, required to adapt the curriculum to ensure access to learning for every student in their class. Open access to our Pastoral Team who are non teaching staff so available throughout the school day. 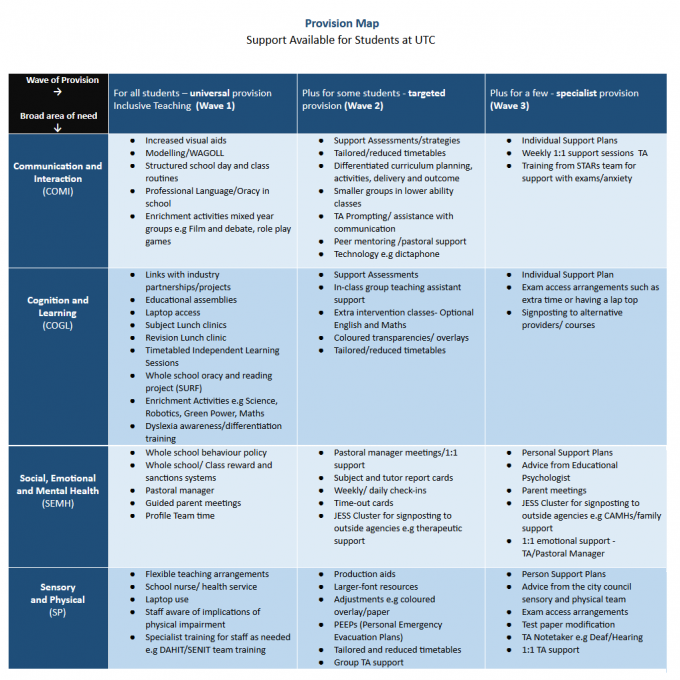 Please see Provision map for support available at UTC. TAs work in subject classrooms and the SEN 1:1 rooms, working with teachers to provide personalised learning programmes for students with special or additional needs.Our TAs develop an improved knowledge of how our students learn best and are better placed to work collaboratively with teachers to deliver lessons designed to minimise individual barriers to learning. We also have Science Technician/TA support focused on specifically supporting identified students in practical science and engineering sessions. Monitoring the progress of students is an integral part of teaching and leadership at UTC. Telephone calls to review support assessment and strategies. If a student has an EHCP, the same regular review conversations take place but the Plan will also be formally reviewed at least annually. We always welcome the views of the students of UTC students. This can be through the Student Council as part of student voice, through profile team time, lesson time or learner voice as part of lesson observations. All students have equal opportunity to access enrichment and extra‐curricular activities at UTC. We are committed to making reasonable adjustments to ensure participation for all. We will always involve parents in how we support their child in such activities in the context of the Code of Practice. UTC is committed to working with students, their parents and families, and other settings/providers to ensure that positive transitions occur. For those students with SEN applying to UTC, the SENCO will meet with student and parents as part of the application process to complete a support assessment, identify need and create a support package. The SENCO can also arrange transition events such as additional visits to UTC, shadowing and support at whole school taster days. The SENCO and pastoral team work closely with other providers and settings to ensure a transition which is as smooth and positive as possible for students with SEN and/or disability. How can communicate with school if I have concerns about my child’s progress? If you are not happy that the concerns are being dealt with, or your child is still not making progress you should speak to the SENCO, Sarah Ellis. If your concerns persist, you should speak to the SEN governor, Fay Best. How will the school communicate with me if there are concerns? Annual parents’ evening provide an opportunity for your child’s teachers to discuss any concerns with you. New Year 10 and 12 students have a ‘Meet the Profile Team Leader’ evening in the first half term in Autumn. How will the school communicate with a student about their SEN? The SENCO will meet identified students to complete a support assessment. The student council represents the students’ views to the school. Each profile team has has representatives on the student council. Please refer to the Complaints Policy and Procedure on the UTC website. In line with the school’s Policy for Complaints in the first instance, concerned parents should discuss their complaints with the Profile Team Leader, Head of Department, Head of Year or SENCO. Should the concern continue, it should be further discussed with the SLT with responsibility for SEN. In the event of the concern not being resolved at this point, parents/carers should contact the Headteacher prior to a concern being forwarded to the Chair of Governors.